You have to remember that starting and growing a business is a marathon, not a sprint. Especially in the early days, it’s all too easy to put in very long hours with no end in sight. Being a solopreneur can quickly turn into a 24/7 job if you’re not careful. Then it’s only a matter of time before you experience exhaustion and—you guessed it—burnout. Sometimes the hardest part of being a solopreneur is knowing when to turn your brain off from work. It’s all too tempting to squeeze in every minute you possibly can to focus on your business. Just remember that finding work-life balance will make you more productive, not less. So, instead of turning into a work robot, make sure to find time also to do enjoyable things that energize and inspire you. According to Oprah Winfrey, “The more you praise and celebrate your life, the more there is in life to celebrate.” As a solopreneur, if you don’t celebrate small milestones along the way, you are going to lose the motivation and drive to continue. So, the key is not to tie how you feel to your long-term goal but to the progress that you are making. The better you feel about yourself and your progress, the more likely it is that you will continue to put in the work that will help you reach your dream. One way to track your progress is by creating done lists. Most people are familiar with to-do lists, but few are familiar with done lists. A done list is a diary of your accomplishments that gives you a sense of progress, heightens positive emotions and helps you to stay motivated. According to Teresa Amabile, co-author of The Progress Principle, it’s important to “track your small wins to motivate big accomplishments.” So, next time you achieve a smaller goal, reward yourself! Some ways you can do this are to do something you truly enjoy, treat yourself to your favorite latte, take a trip or just celebrate your victories with the people around you. As a solopreneur, you’re bound to encounter challenges and setbacks along the way. To stay motivated, it’s essential for you to remember your “why”. Why did you start this business in the first place? Was it because you craved more freedom, flexibility or control over your career? Maybe you wanted to pursue an activity you’re more passionate about, or you just needed to leave behind a legacy you could be proud of. Getting in touch with this big-picture view will not only keep you focused but will provide you with the perspective to make wise decisions. It is likely that passion inspired you to pursue your dream of starting a business. It’s that passion for the work itself that will get you through those rough spots and keep you on track to succeed. Being a solopreneur isn’t always easy, but the rewards are great. By following these tips, you’ll be in a better position to remain energized so you can ultimately reach your long-term goals. Remember: just because you start small, don’t forget to think big! 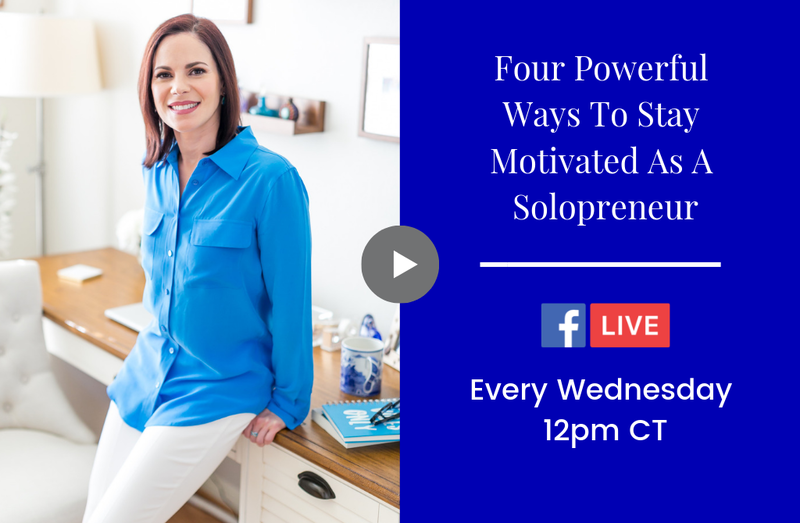 Join me every Wednesday at 12pm CT on Facebook LIVE!